Colm Cavanagh in action for Tyrone. 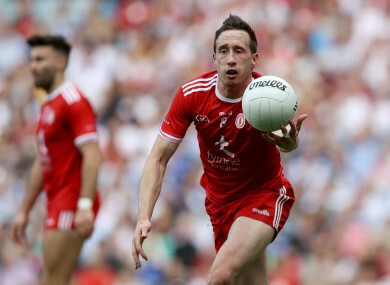 TYRONE MIDFIELDER COLM Cavanagh has distanced himself from the back-and-forth between his manager Mickey Harte and former players-turned-pundits. Red Hand manager Mickey Harte branded criticism from ex-Tyrone players now working the media as a ‘cheap shot’ at their All-Ireland final press event in Garvaghey GAA centre Monday. And this morning as he collected his PwC GAA/GPA Player of the Month accolade, Cavanagh was asked if he’s stuck between a rock and a hard place as someone who’s soldiered with these ex-players through the years, and obviously the family connection. “To be honest, when you’re playing you focus on playing. You let everything else go, what’s being said in the media. “To be honest, I don’t watch whatever’s being said in the media, and I don’t read any of the papers. The only thing I ever see is probably on social media. “I stay away from whatever, myself and Seán obviously my brother. It’s light-hearted conversations about it. He knows as well as me that I have to concentrate on playing football and he can concentrate on doing his punditry. “He’s entitled to his opinion and every other past player is entitled to their opinion. I know well they’re entitled to that, and that’s what they’re there to do. They’re there to analyse and give their opinions and that’s fair. Email “Cavanagh: 'You focus on playing. You let everything else go, what's being said in the media'”. Feedback on “Cavanagh: 'You focus on playing. You let everything else go, what's being said in the media'”.